In the film “Backpack Full of Cash”, there is a striking scene at around 40 minutes in. The whole premise of the film is to make it apparent to viewers of the detrimental effects charter schools and poor funding has had on public schools and the students who attend them. I felt a key scene in this film that demonstrated the theme very well was at the forty-minute mark. It starts with The Education Law Center’s Rhonda Brownstein introducing the fact the Philadelphia School District paid $700 million to charter schools, when they in fact did not have these funds saved. Following Brownstein, the filmmakers included Helen Gym stating that “there is a massive effort underway right now to disinvest in public education,” continuing on with informing viewers that Philadelphia had been forced to shut down 24 public schools in one year. Next, images of the closed schools with dark and upsetting music pass one by one on the screen. The multiple images of shut down, abandoned schools struck a cord and helped me as a viewer visualize the issue that was at hand: loss of “backpacks full of cash”. The narrator explains how each child is given a metaphorical “backpack full of cash” to be spent on them, when they leave their public school and go to the charter school, that leaves significantly less money to pay teachers, transportation for students still attending the neighborhood school, and even to keep the lights on. This hard hit of losing students and their metaphorical backpacks has detrimental affects on the public school system, which by the way does not perform at any less of a quality than the charter schools. 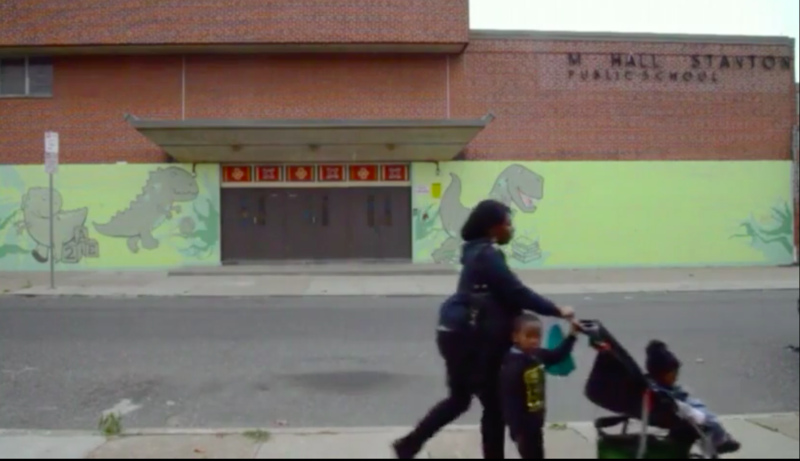 This scene matters because it shows America, and everyone watching what these schools look like now and gives insight to the effect this “effort to disinvest” had on the students who couldn’t afford to leave the neighborhood school. It was edited in such a way to convey this message, placing the public education advocates’ quotes before to set the scene as well as including depressing music to make the viewer feel a certain way. Kevin Welner wrote an article titled “The Dirty Dozen: How Charter Schools Influence Student Enrollment” in which he makes an argument against charter schools, listing and supporting a dozen ways charter schools control which students are allowed in and which are not. I think Welner would have applauded “Backpack Full of Cash” in its effort to expose the wrongdoings of charter schools and showing their effects on public education, putting those that are not encouraged to enroll in the charter schools at a great disadvantage due to a huge lack of resources. Welner writes under number seven of the “dirty dozen,” “The typical scenario involves the parent of a high-needs child who drops by the school to inquire about enrolling and is told that opportunities for that child will be much richer at the public school down the road.” This quote pulled from “The Bum Steer” is in line with the arguments made in “Backpack Full of Cash,” explaining what typically happens when someone presents at a charter school that might not fit the mold that the charter school is looking for, which is often students from families with a low socioeconomic status, like those that did not or could not leave any of the 24 neighborhood schools that were shut down in Philadelphia. Charter schools may present well, but twisting words to manipulate which students get to apply and enroll is the opposite of what public education stands for. Welner, K. G. (April 2013). The Dirty Dozen: How Charter Schools Influence Student Enrollment. Teachers College Record. [online], http://www.tcrecord.org ID Number: 17104. Previous Previous post: SOS, Fly Superman in!